I know I do. There is nothing like having a thick slice of moist banana bread with a cup of coffee. It’s a classic dessert that has been around for ages. Due to this popularity, you are sure to find banana bread in county fairs, church bazaars and fund raisers. I would not be surprised if you probably already have an easy banana bread recipe. Just like Lemon Loaf, it’s one of those recipes that every family has. In fact, you might even have the best banana bread recipe in the world! The first thing we need to do is roast the bananas. It just so happens that I wrote an entire article on the merits of roasting bananas and why everyone should use Roasted Bananas for their baked goods. So go take a look at how it’s done and I’ll be right here waiting for you. Banana bread is considered to be a quick bread. By definition, a quick bread is one that comes together easily and does not require any yeast. Muffins, biscuits and scones are also classified as being quick breads. So, in order to make this banana quick bread, we need two bowls and a whisk. In a large bowl, combine the dry ingredients together to evenly distribute the baking powder and the baking soda. You can either sift the ingredients together or use a whisk. In another medium sized bowl, whisk together all of the wet ingredients, including the roasted bananas. Pour the egg mixture into a well that has been formed in the dry mixture and stir just until moistened. Quickly pour this batter in the prepared pans and bake in a preheated oven for about 55 minutes or until a wooden skewer comes out clean. Pro Tip: Allow the banana loaf to cool down in the pan for at least 10 minutes before turning it out on a wire rack to cool down completely. 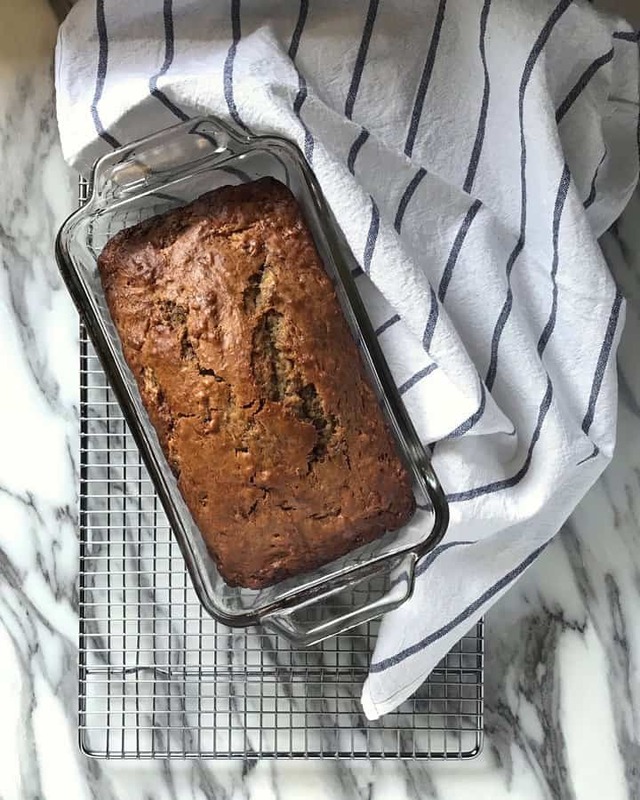 Did you know that banana and zucchini breads actually taste better the next day? It’s true! 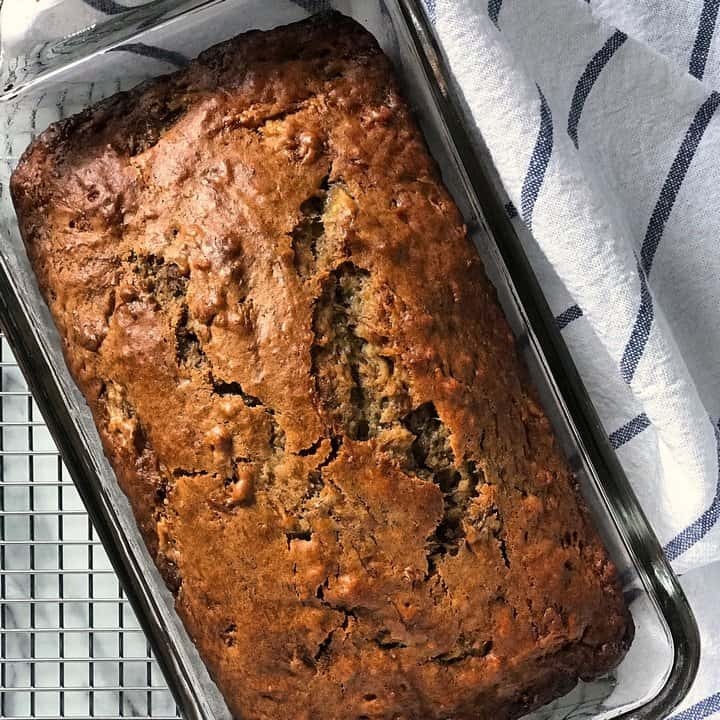 So, if you can resist, once this perfect banana bread had completely cooled down, resist the urge to cut yourself a piece and wrap it up in foil or plastic wrap. Leave it at room temperature to be enjoyed the following day. 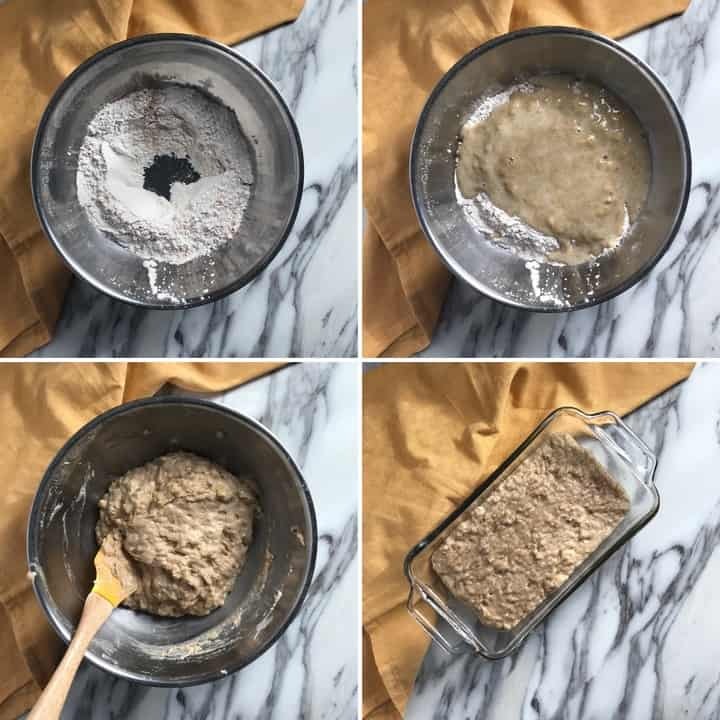 If the center of the bread has sunk, there was a wait time before the batter was placed in the oven, the oven was not properly preheated, the bread was under baked, or the proportions of leavening agent were not right. I originally found this recipe in a magazine called Cook’s Secrets by Better Home and Gardens. The only thing I can tell you is that I was hooked the very first time I made this recipe. In fact, the taste of roasted bananas was so amazing that I also re-published my banana muffins recipe to include this step. As usual, I did make a couple of changes to the recipe; I decreased the total amount of sugar and replaced the white sugar with brown sugar. I also tried substituting some of the oil with applesauce, but I did not like the final texture… it was too gummy. In the end, I just decided to reduce the total amount of oil. Feel free to add walnuts, mini chocolate chips or dried fruit. Swirl in raspberry or strawberry jam. 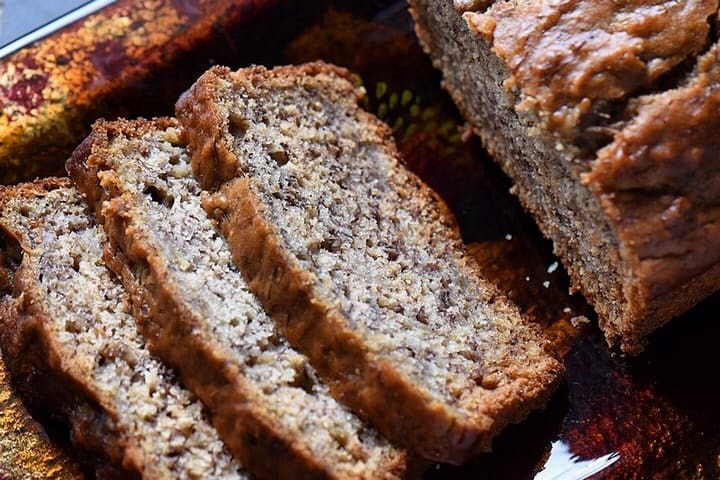 As you can see, there are so many variations that can be made to this wonderful basic recipe for bannana bread. I would love to hear about yours! 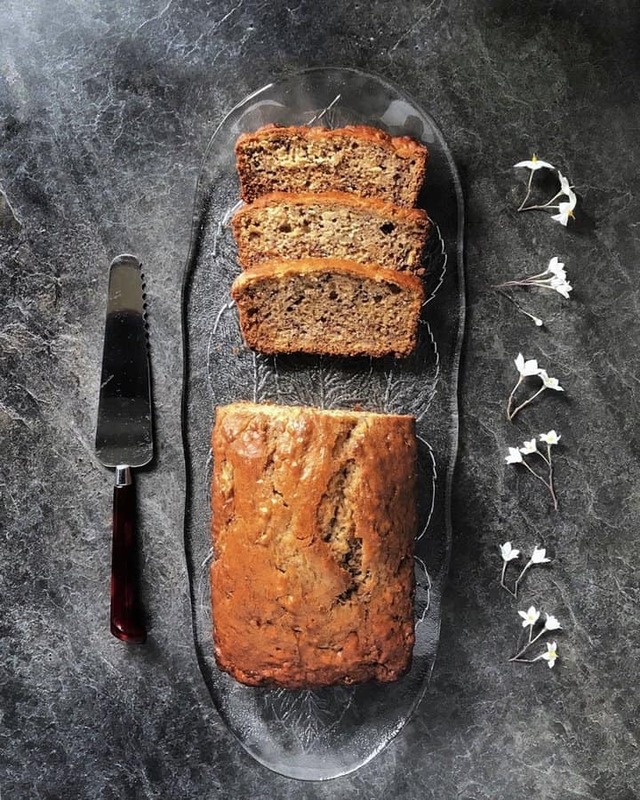 ★★★★★ If you have made this simple banana bread recipe, I would love to hear about it in the comments below and be sure to rate the recipe! 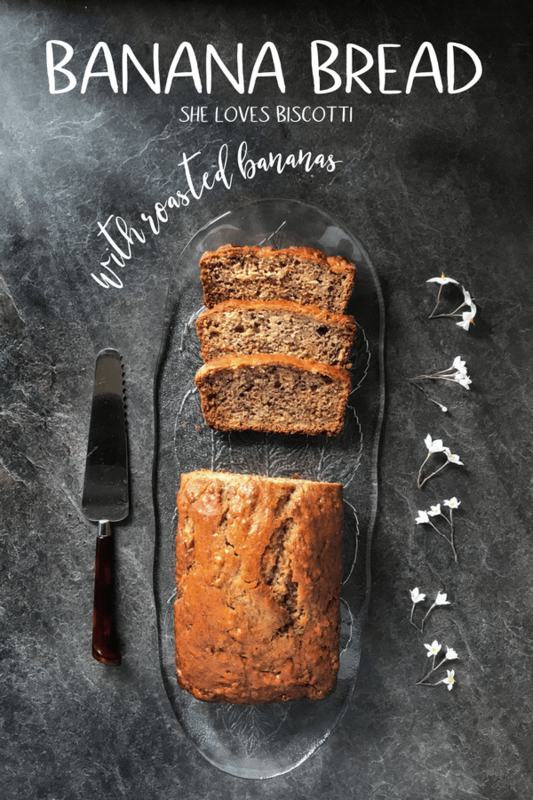 Do you want to know one of the secrets to a perfectly spiced, fragrant & Simple Banana Bread recipe? Use roasted bananas! Preheat the oven to 350℉ (175°C). Grease and flour (or use non-stick spray) a 9 x 5 inch loaf pan. In a large bowl, sift together the flour, baking powder, baking soda, cinnamon, salt, nutmeg and ginger. In a another bowl, whisk together the eggs with the sugar, and the oil. Stir the roasted bananas with the wet ingredients and combine properly. Add the wet ingredients to a well formed in the dry ingredients. Quickly combine together until just moistened. Immediately pour the batter into the greased pan and bake in a preheated oven for about 55-60 minutes or until a wooden skewer comes out clean. Place pan on wire rack to cool for about 10 minutes. Remove banana bread from pan to cool down completely. Wrap the bread in plastic wrap and store overnight at room temperature before serving. Prep time includes the time to roast the bananas. 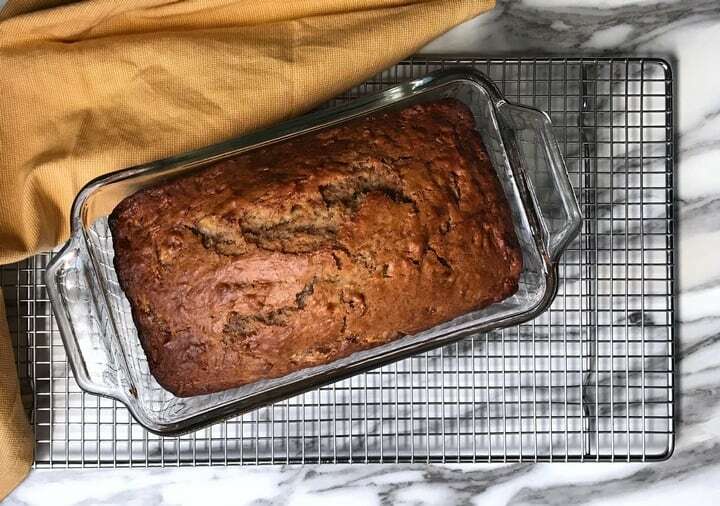 IF YOU ENJOYED THIS BANANA BREAD POST, SAVE IT FOR LATER. Eureka! I feel like Archimedes! Almost. My gluten free loaf is good. If the kids praise me I might add pecans next time. Thank you so much. You burst my bubble! At 82 I thought I knew everything. Just don’t ask my great grand children. LOL. Roasting bananas is a secret. I just put a gluten free pan of your banana bread in the oven. You are my new Julia Child. I will let you know how it turns out. You are too kind Jane… thank you. Keeping my fingers crossed… hope you will like it. I agree with you about roasting…fruits and vegetables definitely have more flavor. I a slice of your banana bread right now would go well with my cup of morning tea. I’ve never tried using roasted bananas… can’t wait to try it! Thanks for the idea.